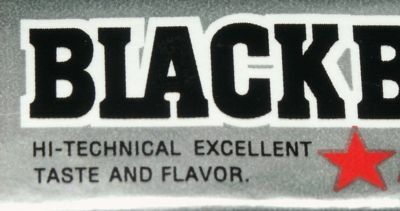 Black Black, with all its Hi-Technical Excellent Taste and Flavor, shall from this day forward be known as “Blech Blech”. That’s about all you need to know about this, but I’ll give you the low down anyway. There is the good, the bad and the worse so I will start with the good. See? I told you. “Hi-Technical Excellent Taste and Flavor”. Maybe that’s where they went wrong, adding taste and flavor. I also have two sticks out of the pack that proclaimed “Yes, Chewing!” on the wrapper which sort of frightens me. We had cookies that were “Chewing!” but I suppose I expect it more in gum. Now for the bad and worse. 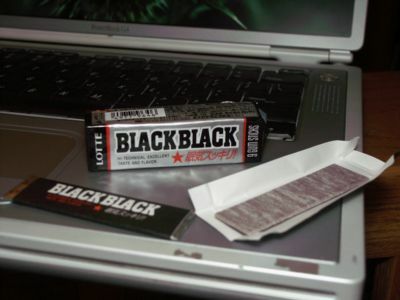 I totally expected Black Black to be some sort of anise flavored gum like Black Jack Gum (incidentally, that’s a pretty fascinating read, go take a peek. You might as well, Black Black isn’t going to get any better. Besides, the Black Jack Gum people make Clove gum – which is very tasty as well – and they make Chicklets too. They are also now owned by Cadbury and Cadbury makes the best candy coated solid chocolate eggs ever. I don’t think Lotte even makes chocolate eggs. Score Black Jack!). Black Black is wrapped in black and the gum itself is black in color (or rather more of a very dark gray. What’s the color between gray and black? That’s Balck Black’s color) so the whole licorice thing was still going strong for me. Everything said “licorice” to me except the smell. The smell said “mint”. Sorta. Maybe “Mint and Extras”, possibly “Mint and Juniper, but don’t let that alarm you. After all, mint is green, juniper is green, it’s a match made in heaven”. Which…no. Before I get on to the taste, I want to mention that the stick has an odd texture. It doesn’t feel like a smooth, powdered sugarless gum yet it’s not as rough as a sugar gum either, just somewhere in between. Maybe if you had a really fine grain emery board or perhaps the last level of polishing before the big fuzzy buffer wheel you would get an idea for the roughness of Black Black. I’m very tempted to stick a bunch of Black Black on a belt sander and see if that actually works. Anyone in need of some furniture refinishing? Really, I have a lot of extra Black Black; one pack houses nine sticks. Onto the taste. One of my Guinea Pigs nailed it when she said “It’s like chewing a Sucrets” and yes, indeed it is. I hate Sucrets. Sucrets has this…taste of…well not menthol, or not good menthol anyway. I’ve tasted menthol in Halls Cough Drops and it’s pretty darned tasty. I’ve tasted whatever it is in Sucrets that makes your mouth all tingly and cool feeling and it’s not so much the tasty. Not even a little bit. It’s not like the Japanese can’t do the good menthol either since Xylish was both minty, mentholy and not so bad. Perhaps there is only so much menthol to go around in Japan and Xylish got there first, took all the good menthol and left Black Black with the dregs. As far as texture goes, Black Black is at least palatable. It’s got a smoothish chew that’s not so rubbery yet not so soft it disintegrates on you. It is a very middle of the road chew. Unfortunately, you might not spend the time testing out its longevity because the flavor fades pretty fast. Then again, maybe you might because fiveish minutes in, the gum is flavorless. Huzzah! Oh wait, I forgot: Your mouth will still be mentholated in a most unpleasant way. Yeah. Plus, it’s pretty darned weird to be chewing a tasteless blob of gum when you are still getting the flavor off your tongue and cheeks from the sub standard mentholation. Rating of 1.5 Wasabi Peas out of a possible 5.